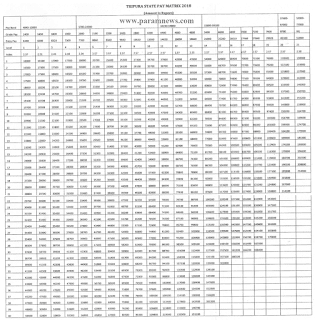 State Pay Matrix 2018" [rounded off to nearest 100 rupees as per 7th CPC pattern). 2.3] Minimum Pay at the Entry Level of the pay matrix shall be Rs. 18,000/-per month for Group-c employees and Rs. 16,000/-per month for Group-D employees of the State Government. 2.4] Annual increment shall be @ 3% per annum. Two dates for grant of increment i'e', on 1st January or 1st July of every year shall continue to apply; provided that an employee shall be entitled to-only one annual increment either on 1st January or on 1st July depending on his date of appointment, promotion or grant of financial up-gradation, Thus' there is no change in the provisions relating to Annual Increments. 2.6] There shall be no change in the existing rates of allowances. 3] Regarding the Pay of employees recruited on fixed pay basis against formal creation of fixed pay posts by keeping in abeyance regular-scale posts, there is no change in the formula. Their Pay shall be fixed at 75% of the Initial Pay in the relevant/ applicable level of "Tripura State Pay Matrix 2018". the level of 2.57, as in case of regular employees. The revised pension/ family pension for pensioners falling under this category shall be determined by multiplying the basic pension/ basic family pension (excluding additional pension), as had been fixed on 01.01.2006 under the Tripura State Civil Services (Revised Pension) Rules 2009 read with its up-to-date amendment, with an appropriate multiplying factor (in Tripura State Pay Matrix, 2018) corresponding to the Level (erstwhile Grade Pay) from which the pensioner has proceeded to retirement, subject to minimum and maximum rate of pension. The amount of revised pension/ family pension so arrived at shall be rounded off to nearest hundred rupees. Pensioners/ family pensioners who have retired on or after 01.01.2006 and on or before 31.03.2017.
pension. The amount of revised pension/ family pension so arrived at, shall be rounded off to nearest hundred rupees. Step - I: The pension amount/ family pension amount, as on 30.09.2018 shall be divided by 2.25. 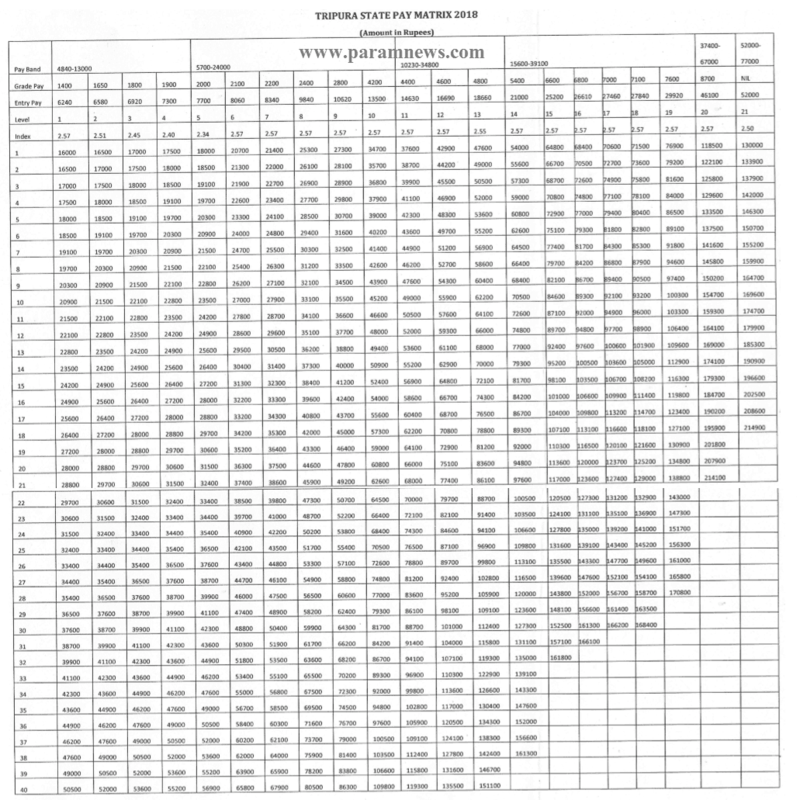 50% of the last basic pay drawn (without DA) in the prescribed level in the Pay Matrix, 2018 w.e.f. 01.10.2018 subject to minimum and maximum rate of pension. The amount of revised pension/ family pension so arrived at shall be rounded off to nearest hundred rupees. 5.1] Minimum pension shall be Rs. 8,000/- per month and the maximum pension shall be Rs. 1,07,450/- per month. 5.2] Existing rates of additional pension shall continue. 6] Detailed instructions on revision of pay, wages, pensions and issued separately.